Writers, faced with a blank piece of paper, often suffer from Writers’ Block. 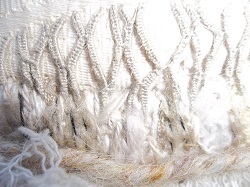 If I am struggling to find the starting point for a piece of Textile Art, I get Thread and Thrum. The Welsh translation for this means more than just wools and yarns; it is an idiom which means ‘anything and everything’. I do anything and everything except sew! Buttons get sorted into jars, beads into boxes, threads into bags. Eventually though, I’ll use my tried and tested techniques – a cup of coffee, a chocolate biscuit and – yes – a blank piece of paper! I have never been one to use sketchbooks to draw out my ideas. I am more of a doodler than a draughtsperson. On the other hand, the words of a poem or song can often start off my creative journey. The Keeper of the River says ‘I am the River, I am its Course’ so I have taken this and some other phrases she uses and doodled around them. Like a river, this is the course which will eventually lead me to produce a piece of Textile Art. 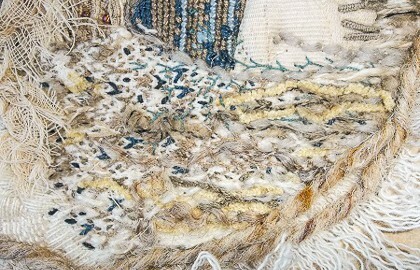 My plans for Textile Art don’t come about through using a sketchbook or even a scrapbook. For me, what I call the book in which I store my ideas is as important as the ideas themselves. So I have a journal and even when I can’t think of things to doodle or find pictures to stick in, I always manage to come across the words which will make me think or wonder or want to remember them.